Available in-store only. Give us a call at 802-658-3313 or swing in! Board only $39 a day. Rentals are first come, first serve. The Slush Slasher is the playful mini-park and powder ripper that changed the game. This innovative shortboard rails turns on the groomers, transition, and in the park; it’s as fun on jibs as it is in the deep stuff. This board is sure to change your perspective on any terrain and put a smile on even the grumpiest of skeptics. 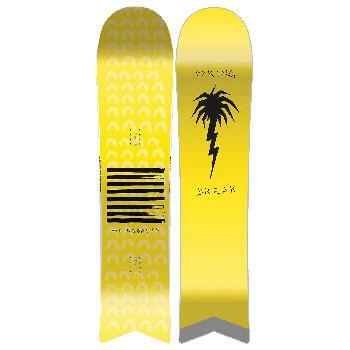 Developed as the antithesis to serious snowboarding, the Spring Break Lightning Palm graphic will cure any tropical depression you might be experiencing. In addition to new construction technology and a low retail price, the Slush Slashers are sure to stand out in a crowd preventing a lost board in your haze of never ending good times. The elongated nose plows over anything in its path while the V-shaped Vacation Tail lets you put these snow sharks on cruise control. With the Slush Slasher, the world is your seven day weekend.